Correspondence analysis is a statistical method used to investigate the relationship between two qualitative variables. Do it in Excel with the XLSTAT software. 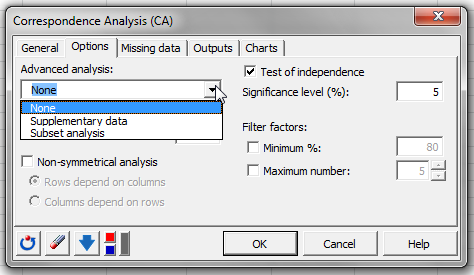 Correspondence Analysis is a powerful method that allows studying the association between two qualitative variables. It is based on the measure of the inertia. The aim of Correspondence Analysis is to represent as much of the inertia on the first principal axis as possible, a maximum of the residual inertia on the second principal axis and so on until all the total inertia is represented in the space of the principal axes. One can show that the number of dimensions of the space is equal to min(m1, m2)-1. 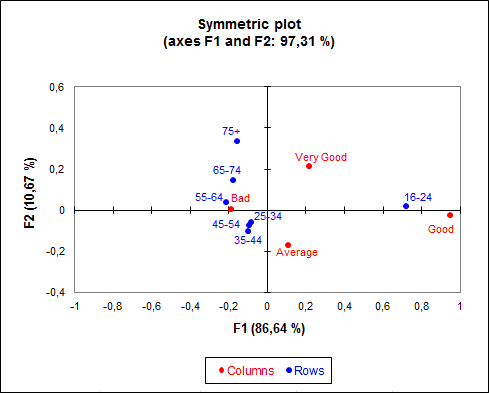 Non-Symmetrical Correspondence Analysis (NSCA), developed by Lauro and D’Ambra in 1984, analyzes the association between the rows and columns of a contingency table while introducing the notion of dependency between the rows and the columns, which leads to an asymmetry in their treatment. The XLSTAT algorithm allows computing both CA and the related method of NSCA in a similar way. In addition to the two Correspondence Analysis methods that were presented, it is also possible to analyze a subset of categories as a new method has been recently developed based on Greenacre (2006). It allows parts of tables to be analyzed while maintaining the margins of the whole table and thus the same weights and chi-square distances of the whole table, simplifying the analysis of large tables by breaking down the interpretation into parts.